One of the oldest dog breeds, the Chow Chow is believed to be one of the first domestic dog breeds to evolve from the wolf. Chows have many seemingly contrasting personality traits. They are stubborn and dominant by nature, yet they usually have good manners. They are not known for their obedience, but they are very loyal, often one-person dogs. The Chow is often introverted around strangers, and perhaps even its family. The biggest concern when selecting a Chow Chow is joint problems, including patellar luxation and hip and elbow dysplasia. Eye problems such as entropion are also somewhat common. Breed Type The Chow Chow is a non-sporting breed. One of the oldest dog breeds, the Chow Chow has been used as a working dog in a variety of capacities. They are best suited to cool to moderate climates. Background According to researchers, the Chow is one of the first domestic dog breeds to evolve from the wolf. A dog similar in appearance to the Chow has been found in a Chinese carving dating back to 150 BC. The breed was introduced to England in the late 18th century. Description The Chow Chow has a thick coat, which may be smooth or rough, and is always solid colored. Red, black, blue, cinnamon and cream are the most common colorings, but they can also be tan, gray or white. Its bluish-black tongue is its most recognizable trait. Its ears are erect and rounded, and its tail fluffy and curved over the back. Average size for the breed is 18-22 inches tall and 45-70 pounds in weight. Care and Feeding The Chow's diet should include fish, rice, wheat and soy. The Chow Chow needs regular brushing to maintain its fluffy coat. Dry shampoo is best for cleaning. The Chow Chow sheds heavily at times. Regular vacuuming is necessary if this breed is to be kept indoors. Housing Your Dog Chows can live indoors or out, but they need at least a small yard to circulate in. As long as they get to go out for walks and play, they can live in small spaces. Social Behaviors Chows usually do well with children. They may be dominant around other dogs and different types of pets, however, and they can be over-protective of their owners. Proper socialization can minimize these tendencies. Handling and Training Generally speaking, Chows do not train very well due to their stubbornness. But with firmness and consistency, they may come around. Housebreaking is usually not a problem. Activities Chows need daily walks and exercise. They may become lazy if you let them, so it is important to enforce their exercise routines. Breeding/Reproduction Potential mates for your Chow should not have family histories of joint problems, thyroid disease, or eye abnormalities. Common Health Problems Eye abnormalities such as entropion and ectropion may be treatable with surgery. Thyroid disease may require medication for the dog. 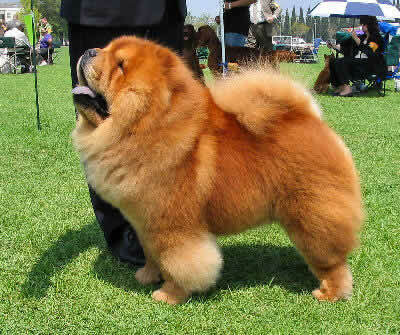 Availability Chow Chows may be difficult to find in many areas, but breeders can be located online. Prices typically range from $500 to over $1,000. Hi,my Mum chow chow put to birth 18 weeks ago and the puppies are ready for sale due to lack of time to reach her full potential.If interested contact(229) 329-7088.Any questions please ask. More photos can be sent on request. Home more important than price.Thanks. Did you find homes for all of them? We just had to put our second chow down after 12 years. She develope. lung cancer. They are such wonderful dogs. Hi my name is Vivian E. I live in Orlando Florida. If you can send him to me I'll take him/her. It' my son's birthday and he wants a dog. Please let me know through my e mail: vrivera03@netzero.net. Thanks Vivian E.